In the old days, mothers would often give their daughters a sourdough starter when they left home to set up their own housekeeping. Sometimes, the same starter was kept alive for generations. Sounds weird, but when you understand what a sourdough starter really is, it makes perfect sense. I make my easy, buttery crescent rolls with non-gmo, organic ingredients because it’s our lifestyle choice. You can use the ingredients you feel comfortable using. When I first made homemade crescent rolls, I felt intimidated. Once I got started, I realized it isn’t hard at all. We make all of our bread. I don’t usually use a bread machine. Not that I’m against them, but I enjoy the whole process of bread making, especially the kneading. I also like to bake my bread in my cast iron dutch oven because of the artisan look it gives the loaf. We had an excessively hot summer. Temperatures were 105 on average with high humidity. Turning the oven on to bake bread would cause the house to get hot and make the air conditioner run non-stop. 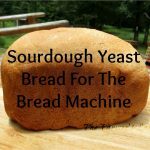 This prompted me to adapt our favorite bread recipe for a bread machine. After a couple of disappointing loaves, I figured it out. I’ll share my recipe with you and my best bread making tips and tricks with you. 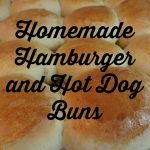 Why do I make homemade hamburger and hot dog buns using this easy, delicious recipe? Because when you remove GMOs and processed foods from your diet, some of the convenience items, like hamburger and hot dog buns, are no longer an option. But considering the many benefits of doing this, making your own becomes a joy. I began making homemade buns just over a year ago and have perfected this recipe for my family. I like this recipe because it’s so versatile. It can be used for hamburger buns, hot dog buns, rolls, I guess anything you want it to be. This complete guide to making and using fresh flour tortillas will walk you through making, storing, and using homemade fresh flour tortillas. You won’t believe how fast, easy, and better tasting they are. When we began making our lifestyle change to Non-Gmo, organic, no processed foods, one of the first things I missed was flour tortillas. My search for how to make my own fresh flour tortillas began. After trying several recipes, I found that the basic recipe was always the same, but just not quite right. So, I worked it out by adding a little twist to make the recipe my own.